Welcome to St. Paul's Church! "Happy the man who finds wisdom, the man who gains understanding!" The first St. Paul's Church of Oxford was the first religious edifice built in Oxford, located on Fort Hill. It was a wooden structure, built in the Village, consecrated in 1816, that served the community for more than forty years. The present St. Paul's Episcopal Church, constructed of bluestone, was designed in the Gothic Revival style by architect, Henry C. Dudley. It was erected in 1857 on the East side of the Village of Oxford. It still stands proudly today, facing the beautiful Washington Park, in Chenango County, NY. 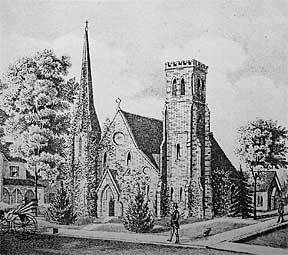 For nearly two centuries, St. Paul's Episcopal Parish has been a witness to God's love and concern for His people in Oxford, NY. St. Paul's provides a welcoming place to give thanks to God, to celebrate good times and provide solace in troubled times. The church family has lovingly cared for and supported many generations, from communions, weddings, births, to funerals and the regular Sunday services …and they continue to do so. Learn about the past history of this wonderful building and what's going on in the church today. Everyone, from all walks of life, are vivaciously welcomed through this website and in person! Over the years St. Paul's has been honored with many generous gifts such as pre-Revolutionary War crystal chandeliers, a new rectory, and a console piano to name a few. The interior of the church has been beautified with the addition of stenciling, stained glass windows, brass chancel furnishings, and a fine Muller organ. Maintenance and modern improvements have been spectacular from electric lighting, plumbing, heating, windows/sidewalks/plaster/stonework upkeep, to a new Welsh slate roof and handicap accessibility. The 150 year-old stone church with the warmth of God's forgiving love at its heart, welcomes you to share the Sunday service at 11:00 am. All buildings are handicap accessible. All are welcome. 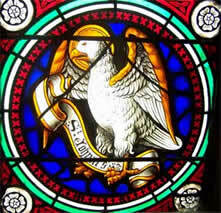 St. Paul's Episcopal Church is a member of the Chenango District of the Diocese of Central New York, a group of eight Episcopal parishes, working together to support an Episcopal Church presence in Chenango County. Father David Hanselman (dhanselm@gmail.com) serves St. Paul's, St. Ann's, and Zion Episcopal Churches of Oxford, Afton, and Greene, NY. He invites you to email him with questions or to share your thoughts and ideas. The doors for learning and communication are readily open through email, phone or visit Fr. Dave in person. The monthly newsletter, "Notes and Messages from St. Paul's Episcopal Church" are available at the door or in PDF here. Fr. Dave was called to serve St. Ann's Episcopal Church (http://www.stannsaftonny.org/), 127 Main Street, Afton, NY; St. Paul's Episcopal Church, 34 Main Street, Oxford and Zion Episcopal Church, (http://www.ziongreene.org/), 10 North Chenango Street, Greene, NY, in February 2011. Fr. Dave was ordained a transitional deacon in May 2011 and ordained a priest in November 2011. Rev. David Hanselman, Email: dhanselm@gmail.com ; Cell: (607) 761-4601; Office: (607) 656-9502 (Zion).